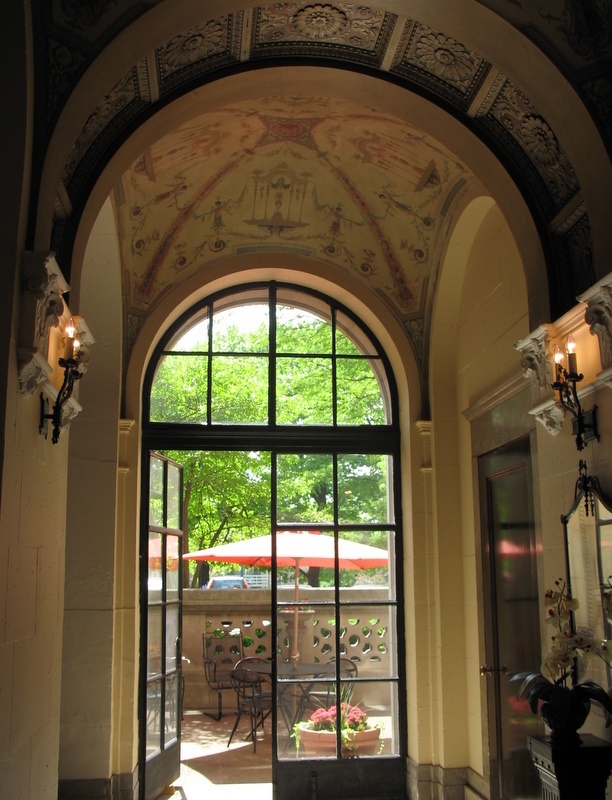 The Belvedere, one of the first luxury apartment buildings in Cincinnati, reeks of Jazz Age glamor. The high rise was constructed in North Avondale in 1925 and was one of the stops on the home tour we went on last weekend. 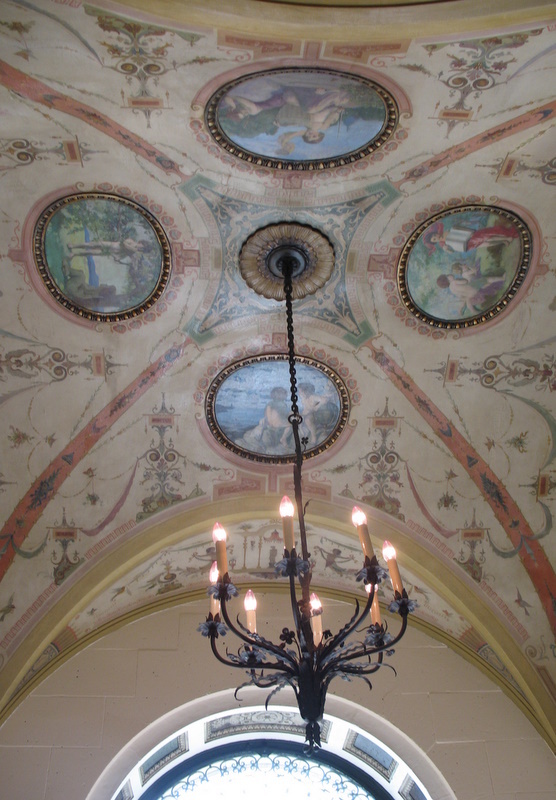 The apartment units originally featured up to 6 bedrooms, as well as separate servants’ quarters. Most residents had maids and drivers. 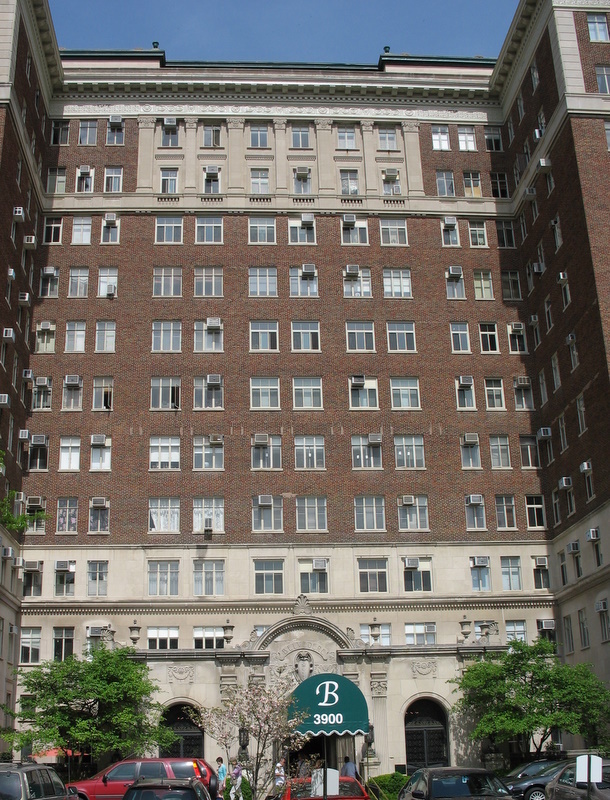 The Belvedere apartments were converted into condominiums in the 1980s and many were divided into 2 and 3-bedroom units to make them more affordable and practical. 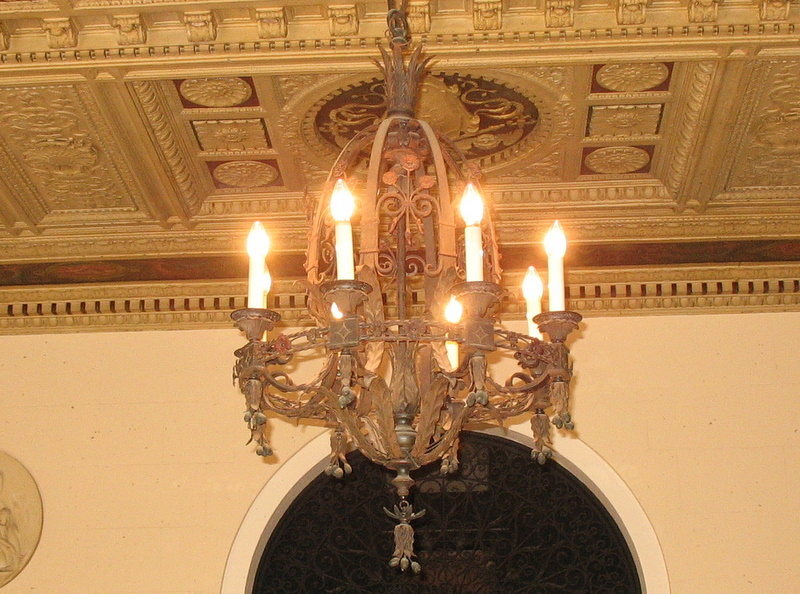 There were lots of fun details in this building, such as the cursive “B” burnished into every single doorknob, the brass elevator indicators that point at the floor levels they’re on as they move up and down, the mail chutes, the wrought-iron chandeliers, and the hand-painted ceilings. Take a look! The building still doesn’t have central air, as you can see by all the A/C window units (above), so it was pretty warm inside. 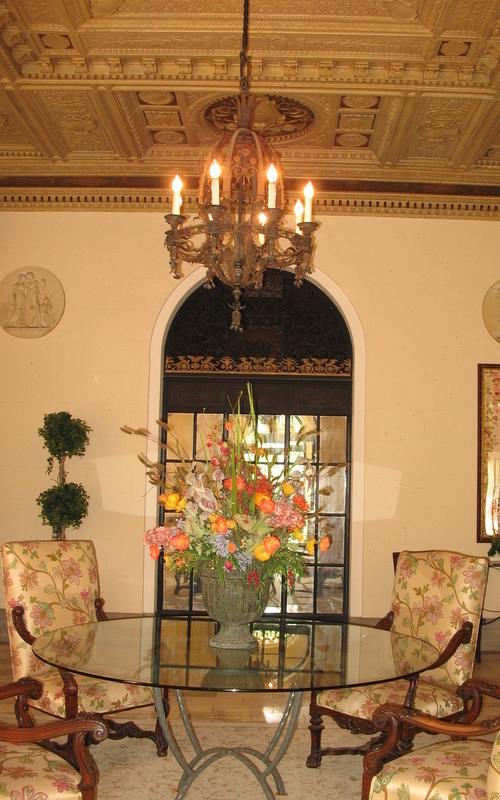 The unit we toured was meticulously restored and beautifully decorated. It was killing me that I couldn’t take photos of it for you. They wisely placed a docent in every room, including the hallways, to make sure renegades with cameras (like me) didn’t try anything. What I found especially interesting was how the (teeny tiny) maid’s room was tucked in a hallway blocked off from the rest of the apartment and had its own (teeny tiny) bathroom. The bathroom reminded me of the kind you’d find on a plane or cruise ship. You actually stepped up into it for some reason, and the sink and shower would be small for a child. The kitchen was also sort of hidden away from the rest of the apartment behind doors, and it wasn’t much bigger than the maid’s apartment. They clearly didn’t care that the cook might not have enough counter space in those days! Each unit has a fireplace, but they are decorative only, which I found interesting. I mean, they were designed that way from the beginning–just for looks! Someone foolishly covered up the original hardwood floors in this unit. I hope whoever buys it will rip this carpeting up and bring these rooms back to life (it’s selling for $103,500). You can check out the MLS listing for more information and pictures. 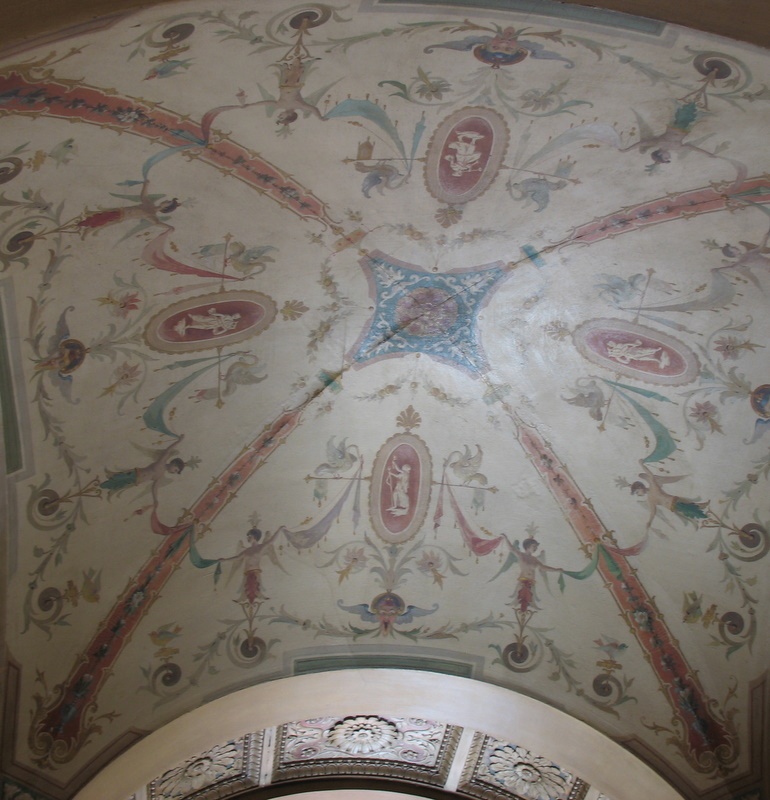 The Belvedere was designed by architect Charles H. Ferber, who was inspired by Second Renaissance Revival Style. I love all things 1920s, so this was one of my favorite stops on the tour. I am ging to hop straight over to peek at the MLS!! Thanks, as always, for all the delights you show us!! You are a peach! Oh, what a treasure! Your blog is terrific – so much to see, and so many juicy, well-researched details. I’ll be back for more peeks inside! oh, I love this too!! And $103,500 actually seems like nothing! Somebody with good taste – please buy this and rip up the carpet like Julia suggested! Julia, thanks again for sharing my city with me! Oh that was fun! I loved that old building! I triple love this. If we didn’t have 2 dogs, one of which is large, I would definitely want to live someplace like this. WOW…I’m in love! Thank you for your sweet comment on my blog – so glad you enjoy it…really made my day! Swoon! I completely love this!!! Wonder why they didn’t want photos taken ? All I can figure is that in order to persuade people to “donate” their houses for the tour, they had to promise the owners that no one would be taking photos of them, or touching anything. Hence, the docents posted at every door to watch you. And I can understand that they wanted to maintain some privacy. There were personal photographs and memorabilia everywhere. I cannot tell you how frustrating it was for me, though. I was glad to at least find some houses on the MLS and in the magazine supplement to show. Sorry I don’t have more to offer! Wow, that’s a lot of space for little $$. That would be at least 4 times as much here. Please note that the monthly HOA fees will be more than your mortgage payment, but taxes of <$700/ year!! Taxes here are approx. $11/$1000 valuation and all the towns are laying off teachers and police/fire in this economy. Perhaps I should move to Cinci!! My grandpa worked in this building during the 80’s when I was a child. They had an apartment there too. I loved it there as a child. I was just thinking about it and decided to look it up. Thank you for posting these pictures. Now I can show my children how beautiful it was. My grandfather, John Will Estes, was the matinance engineer for this building for several years around 1940. He and his family had an apartment there. I am so happy to see that it is so wonderfully maintained and is still being used. Thanks for the pictures and the blog! Along with my sister, Christine, I remember many good times at The Belvedere. Our grandfather was in charge of keeping the boilers operating and stoking the funaces. He was a licenced Operating Engineer. On our many visits I would walk many of the dogs that were owned by the residnts. It was an easy way to earn money. I, too want to thank you for posting these great pictures. I was afraid it had fallen into disrepair. 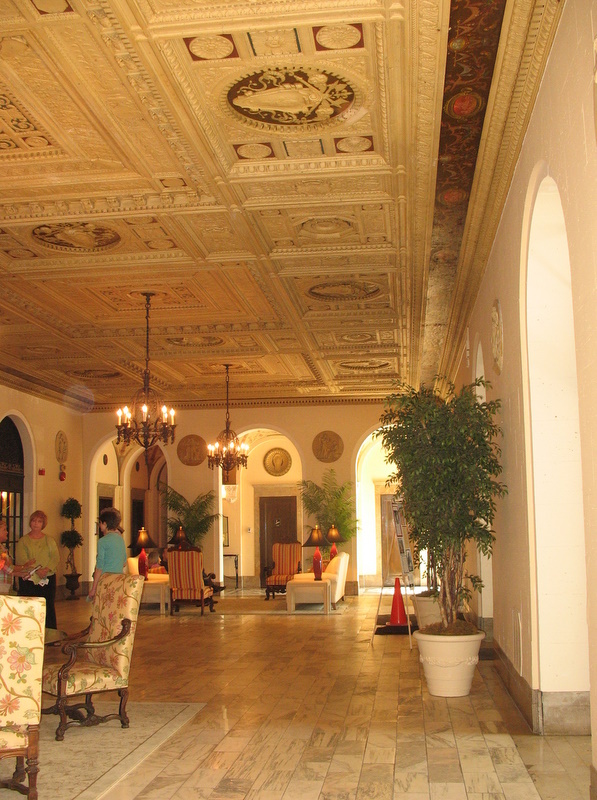 My great-grandparents were among the early residents of the Belvedere! They were in Apt. 315. He died in 1933; I don’t know how long she stayed on (she lived another 20 years). According to the 1930 census, their rent was $380, the third highest that year (Alexander Childs, also a merchant, paid $700, and Julius Kline, retired, was paying $400). Those must have been some of the 6-bedroom apts. Their first single family home upon moving to Cincy was also in North Avondale Park so I also enjoyed your tour picutres of the rest of their neighborhood. I love these photos. I want to live in an old-style house like this someday. Thanks for sharing. The Belvedere attracts some very interesting people, and you actually get to know them. We always enjoy coming over for a chat and a glass of something. And most of the units are very uniquely decorated. We even have a pipe organ in the building. With Avondale right across the street, the Belvedere is centrally located yet affordable. Condo fee looks expensive, but only because most of the units are so huge, per square foot it’s right in line with other condos. And where else do you get a 24-hour door person to receive your mail, take care of your car and help you get your groceries inside? Then there is the clever construction: The builders wanted to attract affluent empty-nesters from the surrounding mansions. So they sent the architect on a tour of New York apartment buildings first, to get ideas and pick the finest, and that shows. The Belvedere is, if one of the major newspaper articles is correct, the first “poured-in-place concrete” apartment building in the U.S., and designed to be fireproof. A few years back, we had invited someone from the fire department to a homeowners’ meeting to give us a talk about fire safety, and he told us we could stay in our units if we couldn’t see smoke in the hallway. And it seems to be true: there was a major fire on the 11th floor in 1996, with damage estimated at $100,000, but it remained contained to one apartment. The building has no north side, only a north corner. Its two wings are completely separated from each other, connected only at ground level and through the roof garden. The latter is great for parties, and you can see the whole city from there, including the downtown fireworks. Each side has two elevators and two staircases. Power supply is safer than elsewhere in the city because we are hooked up directly to the substation down the street. We only lose power when that substation goes off the grid. The big 2008 power outage passed us by. The floor plans are not cookie cutter, they have some fun angles. We actually have the old wood floors, and had our doors stripped of a rainbow of paint layers – including orange, must have been the 70s. Beneath the paint the doors are simply gorgeous, made of a specific kind of walnut wood (circassian). We heard that the trees all died from a disease shortly after the Belvedere was built, and all the wood that exists in the U.S. today is from those trees that were felled back then and put in storage. I don’t know whether that’s completely true, but try to shop for it online and you find that it’s used only in some antique furniture and for rifles. You can easily spend more than $1000 for one rifle stock made of it. The first person to paint that wood must have been insane! Over the last five years we have replaced the old boilers and completely repaired our heating system, and we have selected new windows to replace the originals with something that insulates a lot better and looks just the same from the outside. Owners can put those new windows in at their leisure, and I estimate about a quarter of them have done so by now. We have had the new windows for a good year now, and they make a huge difference! We live on the north corner, and last winter we turned on the heat maybe four or five times. Similar story in the summer, our cooling bills were much lower. Outside noise is also much reduced. We had considered central air, but with us living about halfway up the building, that would have been very expensive, plus we would have had to have some of our ceilings lowered, a thought we didn’t like. So we just put in new window units. Over the years I have collected many documents related to the building’s history, so I could go on, but I think I’ll stop here. Just this as a closing statement: the Belvedere is a true treasure of Cincinnati, and I will live here as long as I possibly can! My husband and I lived in The Belvedere from 1969 to 1972 while he attended The University Of cincinnati Law School and I, having gone to The University of Cincinnati in 1964, graduated and was teaching in Cincinnati while he attended The University of Cincinnati Law School. Having by then lived in Cincinnati for five years I knew the Belvedere well. I am from New York City and knew well, inside and out, the apartment buildings, similar to The Belvedere, that stood in all their grandeur all along Park Avenue and Central Park. We knew we had to live there, knew it was the ONLY place for us to live. It was three years of heaven. From the picture of the “model apartment”, it appears to be the apartment we lived in. The door to the left of the fireplace (it was frustrating it did not work)lead to the master bedroom with a typical small bathroom of the time. Most bedroom and bathrooms were tiny compared to the huge living areas. The living room must have been minimally 25 X 30 feet, with huge windows (as seen) and sills all along the entire apartment. 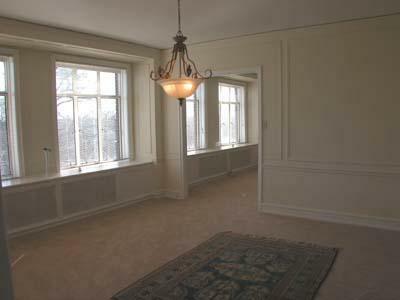 The second room shown is the huge dining room, also with windows all around. No need for blinds, curtains, etc. in that The Belvedere stood huge over the area. Privacy assured. 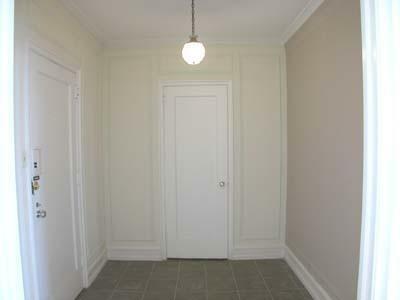 The open doorway shown lead to a small kitchen with a magnificient separate pantry, glass doors and all. Past the kitchen was the maids quarters. It had a narrow hallway that lead to the right to a nice size second maids(?) bedroom we used as a study and to the left, a separate bathroom same size as the master. We used the maids area long hallway to keep our bycycles in. At the end of that hallway was a second/back entry door to the apartmentfrom the main hall, probably meant to assure “the family” was not disturbed by the coming and goings of “the help”. My dear friend lived in the split version of our apartment on another floor. It was easy to break up the apartments, especially our since you entered many apartment into a large foyer, a room in itself, so, when the apartments were split up the foyer entry became a common hall to each apartment. 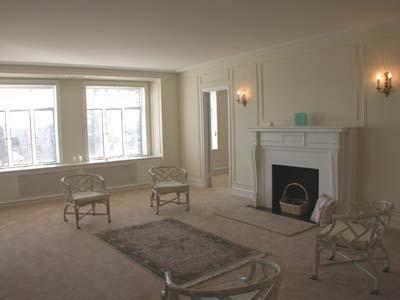 The apartment on the right, with the huge living room with fireplace, has added a “kitchenette” in the left area of the living room, the original master bedroom and bathroom. The apartment on the left turned the huge dining room into a living room, had the origninal kitchen and maids quarters. That would be the main bedroom and bathroom. Either choice, you could not lose. I do not know if they still have the “Concierge Open Mail Boxes”. I would think not, but they were a “touch of Class” at the time. I still have our original lease for our apartment from 1969. We paid $175.00 a month. 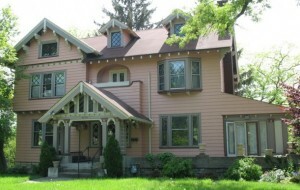 When we returned to the New York area and could afford it, we bought a house built in 1900 that emulated The Belvedere. It required a lot of renovation, which was a labor of love and memeories. Thank you for this memory tour. 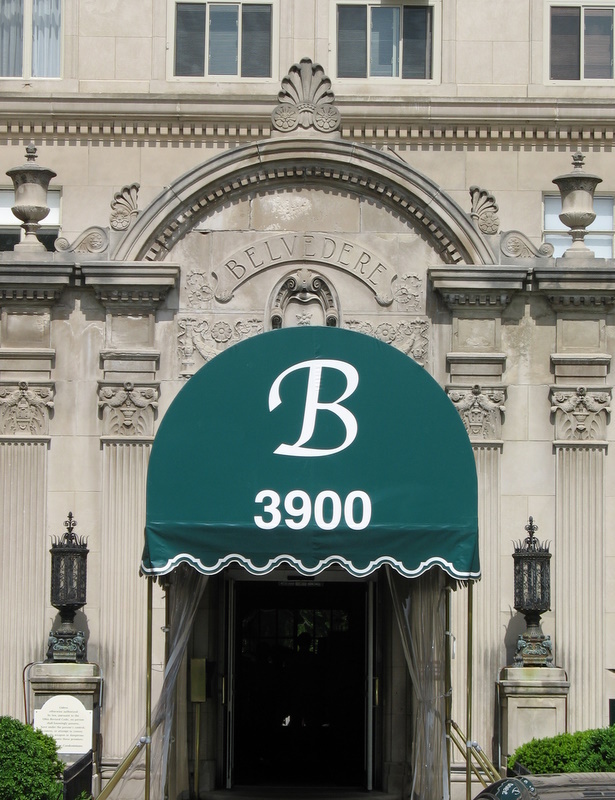 The Belvedere Condominiums now have a fan group on Facebook! Plenty of pictures, a few videos, interesting information, some history. Check it out! .-= Frank Meyer´s last undefined ..If you register your site for free at =-. Living at the Belvedere isn’t what it’s cracked up to be. I lived there for six months and couldn’t wait to get my condo sold and out of the Belvedere. The location is horrible! Without central air, my unit was ungodly hot and the pipes are noisy during the winter months. James, you must have lived there years ago. As I mentioned above, the heating system is long fixed – new boilers, new steam traps. Since 2007 or so, everyone who wants them can install modern windows, the association approved a specific model that looks the same as the old windows. That takes care of insulation against heat and Reading Road sound. I’m also a bit mystified why you bought a condo there if you thought the location was so bad. If you want to go anywhere within Cincinnati, you can’t be in a better position, you’re right in the middle of things. There’s hardly any business in easy walking distance, but that’s the only disadvantage I can think of.